In Hourtin, your kids are kings ! The « Ile aux Enfants », a free leisure park of several hectares, exclusively dedicated to children up to 12 years old, adjoins the lake : your child can thus have fun in the wooden castle, climb pyramids of ropes, play on inflatable structures, on swings, on slides… Qualified organizers also lead several work groups, offering for instance DIY tasks or an introduction to nature. If you are staying with your family on our campsite, you will obviously want your children to spend unforgettable holidays in Gironde. And for the magic to work, we provide our young vacationers with infrastructure that will allow them to have fun 24 hours a day and quickly make new friends. During your stay at the Gironde campsite in Hourtin, your children will be in constant contact with nature. They can run in a guarded and secure space, laugh and have fun in a preserved natural setting. A few kilometers from the campsite, you can also carry out activities that are for the whole family such as horse riding, paintball or stand up paddle on Lake Hourtin and Carcans. The lake is calm and shallow, allowing young children to swim safely. Some water activities such as canoeing and stand up paddling are accessible to children, including beginners. If your little monsters are demanding and claim a kingdom of diversion, go to Children’s Island! This recreational park located near the lake extends over several hectares. 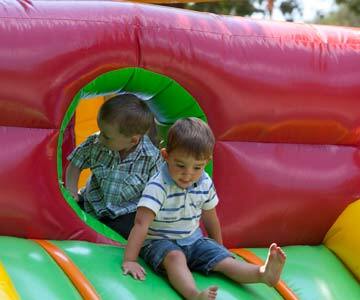 Your children will find medieval castles, inflatable structures, swings, slides and other recreational facilities.